Feminism! It's not just something ill-informed people vocally oppose for no good reason whatsoever. Cats hate it too! I am not trying to exaggerate when I say the Confused Cats Against Feminism Tumblr, created as a sly comeback to the utterly baffling #womenagainstfeminism hashtag, might be the best Tumblr blog since this one. because they have no idea what feminism is. they&apos;re cats. The cats on this Tumblr make a whole lot more sense than most of the poorly informed people tweeting in #womenagainstfeminism. 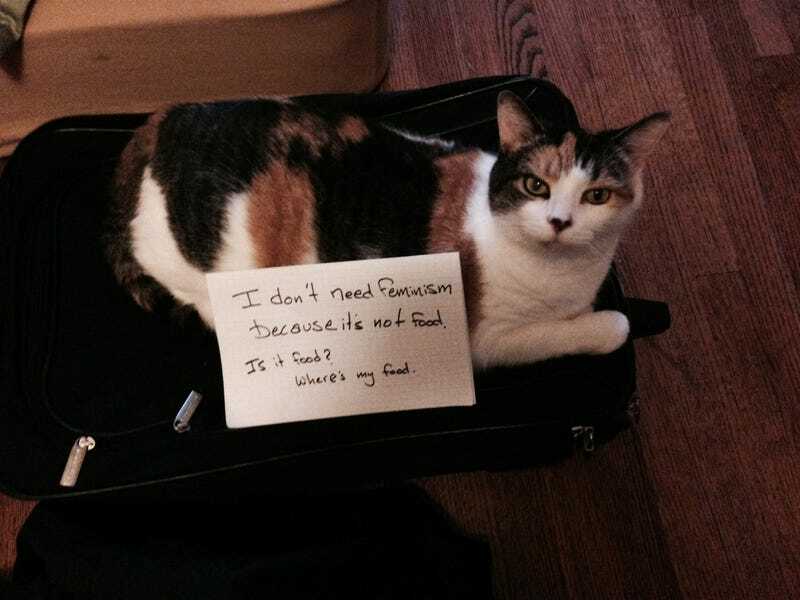 "I don't need feminism because I need tuna. Where is the tuna. I specifically requested tuna. " "I don't need feminism because I am a cat and I don't know what feminism is." "I'm anti-feminist because someone once told me that feminists hate male humans. I was too lazy to do any real research. Come on, I'm a spoiled, pampered cat! Why should I have to think for myself?" "I don't need Feminism because it is not food. Where is my food?" So remember, whenever you are left speechless and looking for a reply to someone who is braying about women against feminism, let these cats guide you out of the inevitable aneurysm you're about to have. Images via Confused Cats Against Feminism Tumblr.